I’d been splitting Reading the Comics posts between Sunday and Thursday to better space them out. But I’ve got something prepared that I want to post Thursday, so I’ll bump this up. Also I had it ready to go anyway so don’t gain anything putting it off another two days. Bill Amend’s FoxTrot Classics for the 27th reruns the strip for the 4th of May, 2006. It’s another probability problem, in its way. Assume Jason is honest in reporting whether Paige has picked his number correctly. Assume that Jason picked a whole number. (This is, I think, the weakest assumption. I know Jason Fox’s type and he’s just the sort who’d pick an obscure transcendental number. They’re all obscure after π and e.) Assume that Jason is equally likely to pick any of the whole numbers from 1 to one billion. Then, knowing nothing about what numbers Jason is likely to pick, Paige would have one chance in a billion of picking his number too. Might as well call it certainty that she’ll pay a dollar to play the game. How much would she have to get, in case of getting the number right, to come out even or ahead? … And now we know why Paige is still getting help on probability problems in the 2017 strips. 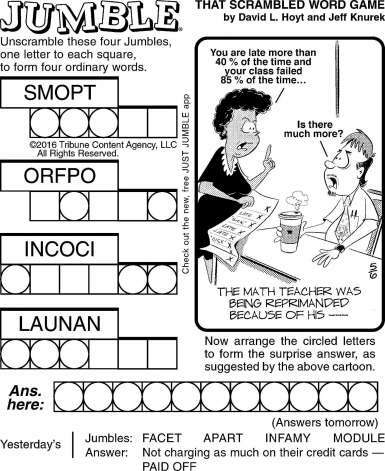 Jeff Stahler’s Moderately Confused for the 27th gives me a bit of a break by just being a snarky word problem joke. The student doesn’t even have to resist it any. Sandra Bell-Lundy’s Between Friends for the 29th of April, 2017. 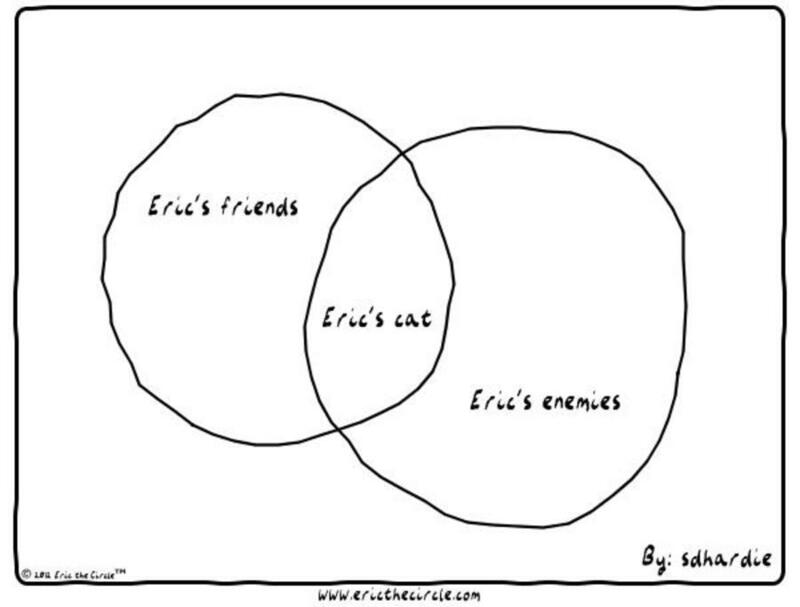 And while it’s not a Venn Diagram I’m not sure of a better way to visually represent that the cartoonist is going for. I suppose the intended meaning comes across cleanly enough and that’s the most important thing. It’s a strange state of affairs is all. Sandra Bell-Lundy’s Between Friends for the 29th also gives me a bit of a break by just being a Venn Diagram-based joke. At least it’s using the shape of a Venn Diagram to deliver the joke. It’s not really got the right content. Harley Schwadron’s 9 to 5 for the 29th is this week’s joke about arithmetic versus propaganda. It’s a joke we’re never really going to be without again. Comic Strip Master Command sent out a big mass of comics this past week. Today’s installment will only cover about half of them. This half does feature a number of comics that show off jokes that’ve run here before. I’m sure it was coincidence. Comic Strip Master Command must have heard I was considering alerting cartoonists that I was talking about them. That’s fine for something like last week when I could talk about NP-complete problems or why we call something a “hypotenuse”. It can start a conversation. But “here’s a joke treating numerals as if they were beings”? All they can do is agree, that is what the joke is. If they disagree at that point they’re just trying to start a funny argument. Scott Metzger’s The Bent Pinky for the 14th sees the return of anthropomorphic numerals humor. I’m a bit surprised Metzger goes so far as to make every numeral either a 3 or a 9. I’d have expected a couple of 2’s and 4’s. I understand not wanting to get into two-digit numbers. The premise of anthropomorphic numerals is troublesome if you need multiple-digit numbers. Jon Rosenberg’s Goats for the 14th doesn’t directly mention a mathematical topic. But the story has the characters transported to a world with monkeys at typewriters. We know where that is. So we see that return after no time away, really. Rick Detorie’s One Big Happy rerun for the 14th sees the return of “110 percent”. Happily the joke’s structured so that we can dodge arguing about whether it’s even possible to give 110 percent. I’m inclined to say of course it’s possible. “Giving 100 percent” in the context of playing a sport would mean giving the full reasonable effort. Or it does if we want to insist on idiomatic expressions making sense. It seems late to be insisting on that standard, but some people like it as an idea. George Herriman’s Krazy Kat for the 22nd of December, 1938. Rerun the 15th of November, 2016. Really though who could sleep when they have a sweet adding machine like that to play with? Someone who noticed that that isn’t machine tape coming out the top, of course, but rather is the punch-cards for a band organ. Curiously low-dialect installment of the comic. George Herriman’s Krazy Kat for the 22nd of December, 1938, was rerun on Tuesday. And it’s built on counting as a way of soothing the mind into restful sleep. Mathematics as a guide to sleep also appears, in minor form, in Darrin Bell’s Candorville for the 13th. I’m not sure why counting, or mental arithmetic, is able to soothe one into sleep. I suppose it’s just that it’s a task that’s engaging enough the semi-conscious mind can do it without having the emotional charge or complexity to wake someone up. I’ve taken to Collatz Conjecture problems, myself. Terri Libenson’s Pajama Diaries for the 16th sees the return of Venn Diagram jokes. And it’s a properly-formed Venn Diagram, with the three circles coming together to indicate seven different conditions. Gary Wise and Lance Aldrich’s Real Life Adventures for the 16th just name-drops rhomboids, using them as just a funny word. Geometry is filled with wonderful, funny-sounding words. I’m fond of “icosahedron” myself. But “rhomboid” and its related words are good ones. I think they hit that sweet spot between being uncommon in ordinary language without being so exotic that a reader’s eye trips over it. However funny a “triacontahedron” might be, no writer should expect the reader to forgive that pile of syllables. A rhomboid is a kind of parallelogram, so it’s got four sides. The sides come in two parallel pairs. Both members of a pair have the same length, but the different pairs don’t. They look like the kitchen tiles you’d get for a house you couldn’t really afford, not with tiling like that. 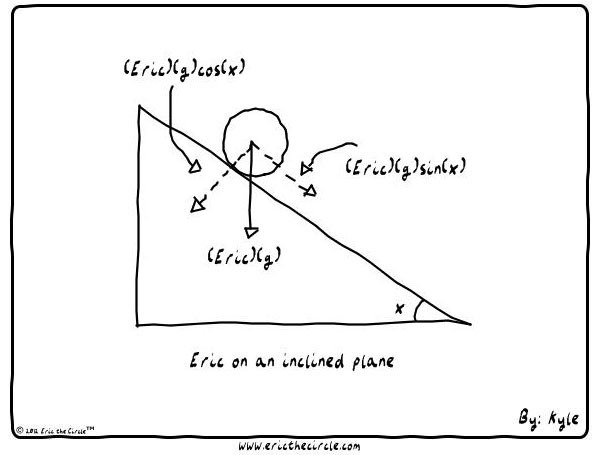 When I split last week’s mathematically-themed comics I had just supposed there’d be some more on Friday to note. Live and learn, huh? Well, let me close out last week with a not-too-long essay. Better a couple of these than a few Reading the Comics posts long enough to break your foot on. 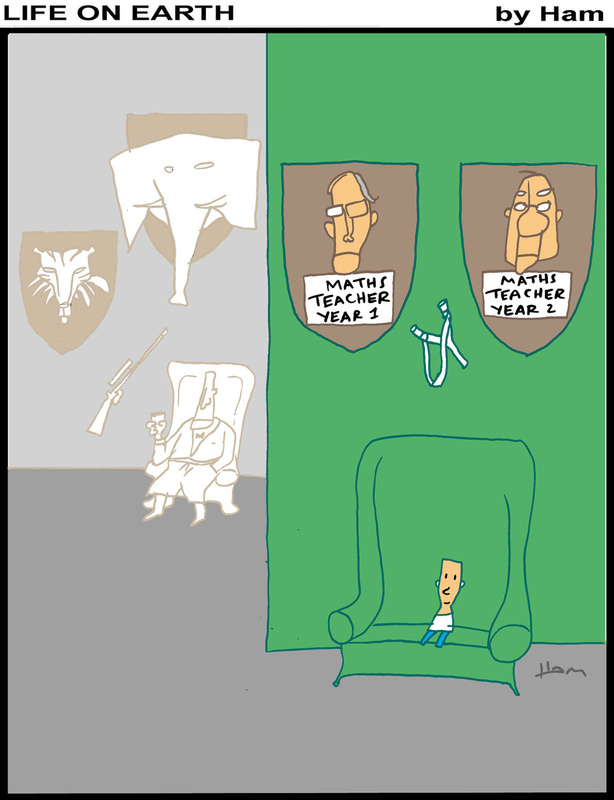 Adrian Raeside’s The Other Coast for the 6th uses mathematics as a way to judge the fit and the unfit. (And Daryl isn’t even far wrong.) It’s understandable and the sort of thing people figure should flatter mathematicians. But it also plays on 19th-century social-Darwinist/eugenicist ideas which try binding together mental acuity and evolutionary “superiority”. It’s a cute joke but there is a nasty undercurrent. Wayno’s Waynovision for the 6th is this essay’s pie chart. Good to have. Hilary Price’s Rhymes With Orange for the 7th of July, 2016. I don’t know how valid it is; I don’t use the bar stools, myself. Hilary Price’s Rhymes With Orange for the 7th	is this essay’s Venn Diagram joke. Good to have. Rich Powell’s Wide Open for the 7th	shows a Western-style “Convolution Kid”. It’s shown here as just shouting numbers in-between a count so as to mess things up. That matches the ordinary definition and I’m amused with it as-is. Convolution is a good mathematical function, though one I don’t remember encountering until a couple years into my undergraduate career. It’s a binary operation, one that takes two functions and combines them into a new function. It turns out to be a natural way to understand signal processing. The original signal is one function. The way a processor changes a signal is another function. The convolution of the two is what actually comes out of the processing. Dividing this lets us study the behaviors of the processor separate from a particular problem. And it turns up in other contexts. We can use convolution to solve differential equations, which turn up everywhere. We need to solve the differential equation for a special particular boundary condition, one called the Dirac delta function. That’s a really weird one. You have no idea. And it can require incredible ingenuity to find a solution. But once you have, you can find solutions for every boundary condition. You convolute the solution for the special case and the boundary condition you’re interested in, and there you go. The work may be particularly hard for this one case, but it is only the one case. Daniel Beyer’s Long Story Short for the 9th of July, 2016. The link’s probably good for a month or so. If you’re in the far future don’t worry about telling me how the link turned out, though. It’s not that important that I know. Daniel Beyer’s Long Story Short for the 9th	is this essay’s mathematical symbols joke. Good to have. Bill Amend’s FoxTrot Classics for the 28th of November (originally run in 2004) depicts a “Christmas Card For Smart People”. It uses the familiar motif of “ability to do arithmetic” as denoting smartness. The key to the first word is remembering that mathematicians use the symbol ‘e’ to represent a number that’s just a little over 2.71828. We call the number ‘e’, or something ‘the base of the natural logarithm’. It turns up all over the place. If you have almost any quantity that grows or that shrinks at a speed proportional to how much there is, and describe how much of stuff there is over time, you’ll find an ‘e’. Leonhard Euler, who’s renowned for major advances in every field of mathematics, is also renowned for major advances in notation in physics, and he gave us ‘e’ for that number. And so that inspires this essay’s edition title. There are several comics in this selection that are about the symbols or the representations of mathematics, and that touch on the subject as a visual art. Matt Janz’s Out of the Gene Pool for the 28th of November first ran the 26th of October, 2002. It would make for a good word problem, too, with a couple of levels: given the constraints of (a slightly looser) budget, how do they get the greatest number of cookies? Or if some cookies are better than others, how do they get the most enjoyment from their cookie purchase? Working out the greatest amount of enjoyment within a given cookie budget, with different qualities of cookies, can be a good introduction to optimization problems and how subtle they can be. Bill Holbrook’s On The Fastrack for the 29th of November speaks in support of accounting. It’s a worthwhile message. It doesn’t get much respect, not from the general public, and not from typical mathematics department. The general public maybe thinks of accounting as not much more than a way companies nickel-and-dime them. If the mathematics departments I’ve associated with are fair representatives, accounting isn’t even thought of except by the assistant professor doing a seminar on financial mathematics. (And I’m not sure accounting gets mentioned there, since there’s exciting stuff about the Black-Scholes Equation and options markets to think about instead.) This despite that accounting is probably, by volume, the most used part of mathematics. Anyway, Holbrook’s strip probably won’t get the field a better reputation. But it has got some great illustrations of doing things with numbers. The folks in mathematics departments certainly have had days feeling like they’ve done each of these things. Bill Holbrook’s On The Fastrack for the 29th of November, 2015. While the strip’s focus is accountants, it is true that most mathematicians will spend hours overhauling their 6’s. Dave Coverly’s Speed Bump for the 30th of November is a compound interest joke. I admit I’ve told this sort of joke myself, proposing that the hour cut out of the day in spring when Daylight Saving Time starts comes back as a healthy hour and three minutes in autumn when it’s taken out of saving. If I can get the delivery right I might have someone going for that three minutes. Mikael Wulff and Anders Morgenthaler’s Truth Facts for the 30th of November is a Venn diagram joke for breakfast. I would bet they’re kicking themselves for not making the intersection be the holes in the center. Mark Anderson’s Andertoons for this week interests me. It uses a figure to try explaining how to relate gallon and quart an pint and other units relate to each other. I like it, but I’m embarrassed to say how long it took in my life to work out the relations between pints, quarts, gallons, and particularly whether the quart or the pint was the larger unit. I blame part of that on my never really having to mix a pint of something with a quart of something else, which ought to have sorted that out. Anyway, let’s always cherish good representations of information. Good representations organize information and relationships in ways that are easy to remember, or easy to reconstruct or extend. John Graziano’s Ripley’s Believe It or Not for the 2nd of December tries to visualize how many ways there are to arrange a Rubik’s Cube. Counting off permutations of things by how many seconds it’d take to get through them all is a common game. The key to producing a staggering length of time is that it one billion seconds are nearly 32 years, and the number of combinations of things adds up really really fast. There’s over eight billion ways to draw seven letters in a row, after all, if every letter is equally likely and if you don’t limit yourself to real or even imaginable words. Rubik’s Cubes have a lot of potential arrangements. Graziano misspells Rubik, but I have to double-check and make sure I’ve got it right every time myself. I didn’t know that about the pigeons. Charles Schulz’s Peanuts for the 2nd of December (originally run in 1968) has Peppermint Patty reflecting on the beauty of numbers. I don’t think it’s unusual to find some numbers particularly pleasant and others not. Some numbers are easy to work with; if I’m trying to add up a set of numbers and I have a 3, I look instinctively for a 7 because of how nice 10 is. If I’m trying to multiply numbers, I’d so like to multiply by a 5 or a 25 than by a 7 or an 18. Typically, people find they do better on addition and multiplication with lower numbers like two and three, and get shaky with sevens and eights and such. It may be quirky. My love is a wizard with 7’s, but can’t do a thing with 8. But it’s no more irrational than the way a person might a pyramid attractive but a sphere boring and a stellated icosahedron ugly. I’ve seen some comments suggesting that Peppermint Patty is talking about numerals, that is, the way we represent numbers. That she might find the shape of the 2 gentle, while 5 looks hostile. (I can imagine turning a 5 into a drawing of a shouting person with a few pencil strokes.) But she doesn’t seem to say one way or another. She might see a page of numbers as visual art; she might see them as wonderful things with which to play. 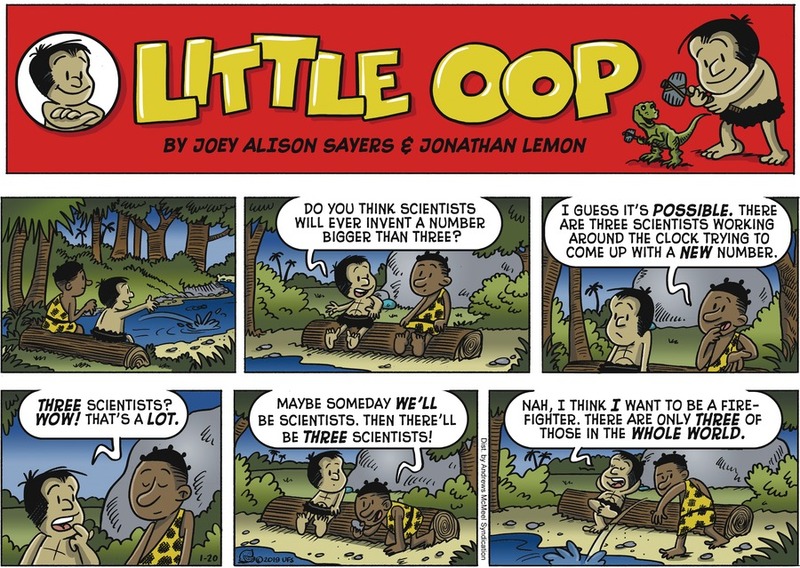 Some of the past several days’ mathematically-themed comic strips have bits of wordplay in them. That’ll do for the theme. We get some familiar topics along the way. Rick Detorie’s One Big Happy for the 6th of October, 2015. Ruthie works out the odds. Niklas Eriksson’s Carpe Diem for the 6th of October is a badly-timed Pi Day strip. Niklas Eriksson’s Carpe Diem for the 6th of October, 2015. Tom Thaves’s Frank and Ernest for the 8th of October is a kids-resisting-algebra problem. The kid asks why ‘x’ has to be equal to something, why it can’t just be ‘x’. He’s wiser than his teacher has taught. We use ‘x’ as the name for a number whose exact identity we don’t know right away. Often, especially in introductory algebra, we hope to work out what number it is. That’s the sort of problem that makes us find x, or solve for x. But we don’t always care what x is. Sometimes we just want to say that it’s an example of a number with some interesting properties. We often use it this way when we try drawing the plot of a function. The plot shows all the coordinate sets that make some equation true, and we need x to organize our thoughts about that, but we never really care what x is. Alternatively, x might be a parameter, something which has to be a fixed number for the sake of doing other work, but whose value we don’t really care about. This would be an eccentric choice — usually parameters are from earlier in the alphabet, rarely later than ‘l’ and almost never past ‘t’ — but sometimes that’s the best alternative. In Jef Mallett’s Frazz for the 8th of October, Caulfield answers his teacher’s demand to “show his work” by presenting a slide rule. It’s a cute joke although I’m not on Caulfield’s side here. If all anyone cared about was whether the calculation was right we’d need no mathematics. We have computers. What is worth teaching is “how do you know what to compute”, with a sideline of “can you do the computations correctly”. It’s important to know what you mean to do. It’s also important to know how to plausibly find an answer if you don’t know exactly what to do. None of that is shown by the answer alone. Jim Benton’s Jim Benton Cartoons for the 8th of October is some more mathematics wordplay. I’m amused by its logic. Samson’s Dark Side of the Horse for the 9th of October is the first anthropomorphized-numerals joke we’ve had in a while. Zach Weinersmith’s Saturday Morning Breakfast Cereal for the 9th of October is our Venn Diagram joke for this installment. And it’s not quite a proper Venn diagram, but it’s hard to draw a proper Venn diagram for four propositions. Wikipedia’s entry offers a couple of examples of four-set Venn diagrams. The one made of ellipses is not too bad, although it also evokes “logo for some maybe European cable TV channel” to my eye. Disney’s Donald Duck for the 10th of October, 2015. A tough moment for any academician. Disney’s Donald Duck for the 10th of October, a rerun from goodness knows when, depicts accurately the most terrifying moment a mathematician endures. I am delighted to see that the equations written out are correct and even consistent from one panel to the next. And yes, real mathematicians will sometimes write down what seem like altogether too-obvious propositions. That’s a good way of making sure you aren’t tripping over the easy stuff on the way to the bigger conclusions. I think it’s a bit implausible that the entire board would be this level of stuff — by the time you have your PhD, at least in mathematics or physics, you don’t need help remembering what the cosine of 120 degrees is — but it’s all valid stuff. Well, I could probably use the help remembering the tangent angle-addition formula, if I ever needed to work out the tangent of the sum of two angles. The good news is I’ve got a couple of comic strips I feel responsible including the pictures for. (While I’m confident I could include all the comics I talk about as fair use — I make comments which expand on the strips’ content and which don’t make sense without the original — Gocomics.com links seem reasonably stable and likely to be there in the future. Comics Kingdom links generally expire after a month except to subscribers and I don’t know how long Creators.com links last.) And a couple of them talk about rock bands, so, that’s why I picked that titel. Zach Weinersmith’s Saturday Morning Breakfast Cereal for the 17th of September is a subverted-fairy-tale-moral strip, naturally enough. It’s also a legitimate point, though. Unlikely events do happen sometimes, and it’s a mistake to draw too-strong conclusions from them. This is why it’s important to reproduce interesting results. It’s also why, generally, we like larger sample sizes. It’s not likely that twenty fair coins flipped will all come up tails at once. But it’s far more likely that will happen than that two hundred fair coins flipped will all come up tails. And that’s far more likely than that two thousand fair coins will. For that matter, it’s more likely that three-quarters of twenty fair coins flipped will come up tails than that three-quarters of two hundred fair coins will. And the chance that three-quarters of two thousand fair coins will come up tails is ignorable. If that happens, then something interesting has been found. In Juba’s Viivi and Wagner for the 17th of September, Wagner announces his decision to be a wandering mathematician. I applaud his ambition. If I had any idea where to find someone who needed mathematics done I’d be doing that myself. If you hear something give me a call. I’ll be down at the City Market, in front of my love’s guitar case, multiplying things by seven. I may get it wrong, but nobody will know how to correct me. Daniel Beyer’s Long Story Short for the 18th of September, 2015. I never actually heard of Tool before this comic. Daniel Beyer’s Long Story Short for the 18th of September uses a page full of calculations to predict when prog-rock band Tool will release their next album. (Wikipedia indicates they’re hoping for sometime before the end of 2015, but they’ve been working on it since 2008.) Some of the symbols make a bit of sense as resembling those of quantum physics. An expression like (in the lower left of the board) resembles a probability distribution calculation. (There should be a ^ above the H there, but that’s a little beyond what WordPress can render in the simple mathematical LaTeX tools it has available. It’s in the panel, though.) The letter ψ stands for a probability wave, containing somehow all the information about a system. The composition of symbols literally means to calculate how an operator — a function that has a domain of functions and a range of functions — changes that probability distribution. In quantum mechanics every interesting physical property has a matching operator, and calculating this set of symbols tells us the distribution of whatever that property is. H generally suggests the total energy of the system, so the implication is this measures, somehow, what energies are more and are less probable. I’d be interested to know if Beyer took the symbols from a textbook or paper and what the original context was. Dave Whamond’s Reality Check for the 19th of September brings in another band to this review. It uses a more basic level of mathematics, though. Percy Crosby’s Skippy from the 19th of September — rerun from sometime in 1928 — is a clever way to get a word problem calculated. It also shows off what’s probably been the most important use of arithmetic, which is keeping track of money. Accountants and shopkeepers get little attention in histories of mathematics, but a lot of what we do has been shaped by their needs for speed, efficiency, and accuracy. And one of Gocomics’s commenters pointed out that the shopkeeper didn’t give the right answer. Possibly the shopkeeper suspected what was up. Paul Trap’s Thatababy for the 20th of September uses a basic geometry fact as an example of being “very educated”. I don’t think the area of the circle rises to the level of “very” — the word means “truly”, after all — but I would include it as part of the general all-around awareness of the world people should have. Also it fits in the truly confined space available. I like the dad’s eyes in the concluding panel. Also, there’s people who put eggplant on pizza? Really? Also, bacon? Really? Alex Hallatt’s Arctic Circle for the 21st of September, 2015. Alex Hallatt’s Arctic Circle for the 21st of September is about making your own luck. I find it interesting in that it rationalizes magic as a thing which manipulates probability. As ways to explain magic for stories go that isn’t a bad one. We can at least imagine the rigging of card decks and weighting of dice. And its plot happens in the real world, too: people faking things — deceptive experimental results, rigged gambling devices, financial fraud — can often be found because the available results are too improbable. For example, a property called Benford’s Law tells us that in many kinds of data the first digit is more likely to be a 1 than a 2, a 2 than a 3, a 3 than a 4, et cetera. This fact serves to uncover fraud surprisingly often: people will try to steal money close to but not at some limit, like the $10,000 (United States) limit before money transactions get reported to the federal government. But that means they work with checks worth nine thousand and something dollars much more often than they do checks worth one thousand and something dollars, which is suspicious. Randomness can be a tool for honesty. Peter Maresca’s Origins of the Sunday Comics feature for the 21st of September ran a Rube Goldberg comic strip from the 19th of November, 1913. That strip, Mike and Ike , precedes its surprisingly grim storyline with a kids-resisting-the-word-problem joke. The joke interests me because it shows a century-old example of the joke about word problems being strings of non sequiturs stuffed with unpleasant numbers. I enjoyed Mike and Ike’s answer, and the subversion of even that answer. 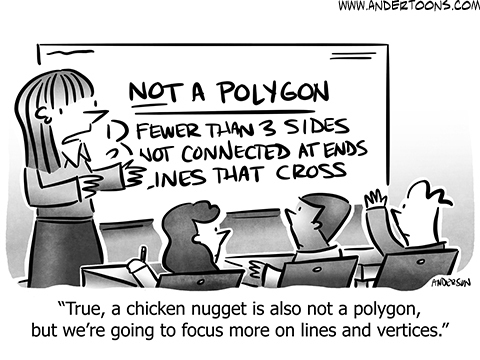 Mark Anderson’s Andertoons for the 22nd of September tries to optimize its targeting toward me by being an anthropomorphized-mathematical-objects joke and a Venn diagram joke. Also being Mark Anderson’s Andertoons today. If I didn’t identify this as my favorite strip of this set Anderson would just come back with this, but featuring monkeys at typewriters too. 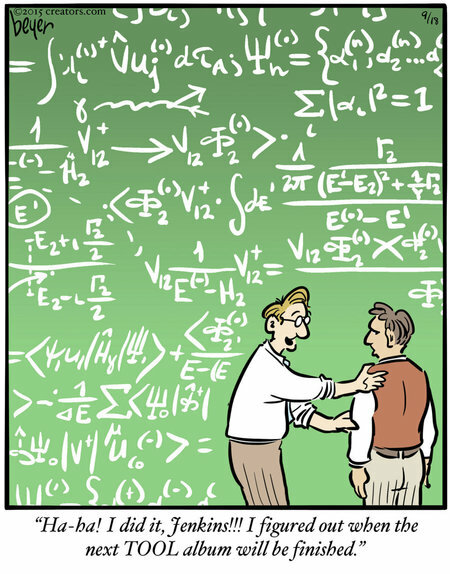 I assume that Comic Strip Master Command ordered many mathematically-themed comic strips to coincide with the United States school system getting back up to full. That or they knew I’d have a busy week. 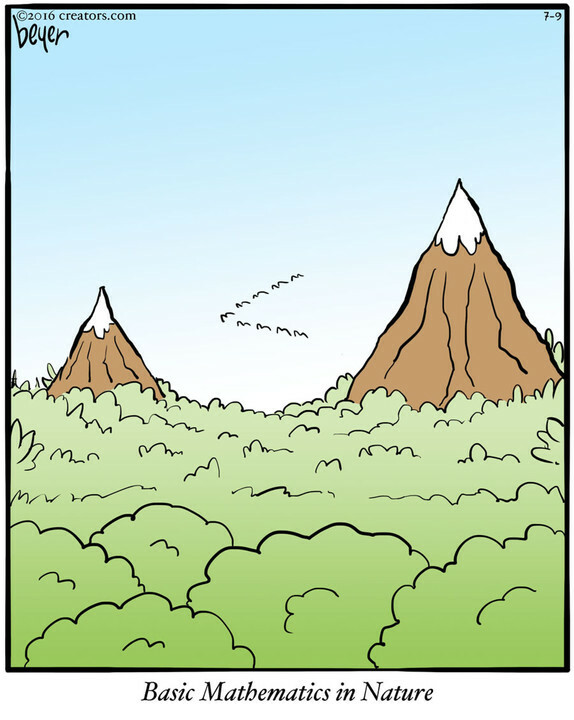 This is only the first part of comic strips that have appeared since Tuesday. Mel Henze’s Gentle Creatures for the 7th and the 8th of September	use mathematical talk to fill out the technobabble. It’s a cute enough notion. These particular strips ran last year, and I talked about them then. The talk of a “Lagrangian model” interests me. It name-checks a real and important and interesting scientist who’s not Einstein or Stephen Hawking. But I’m still not aware of any “Lagrangian model” that would be relevant to starship operations. Jon Rosenberg’s Scenes from a Multiverse for the 7th of September speaks of a society of “powerful thaumaturgic diagrammers” who used Venn diagrams not wisely but too well. The diagrammers got into trouble when one made “a Venn diagram that showed the intersection of all the Venns and all the diagrams”. I imagine this not to be a rigorous description of what happened. 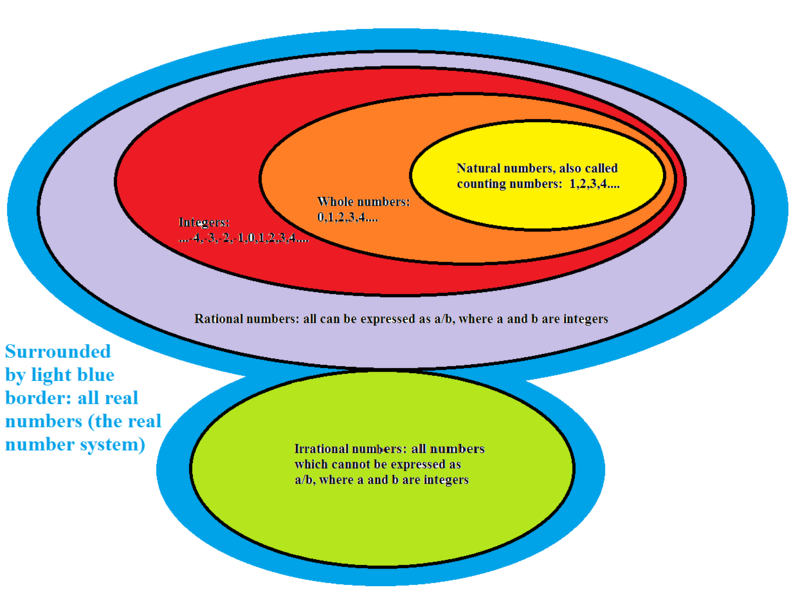 But Venn diagrams match up well with many logic problems. And self-referential logic, logic statements that describe their own truth or falsity, is often problematic. 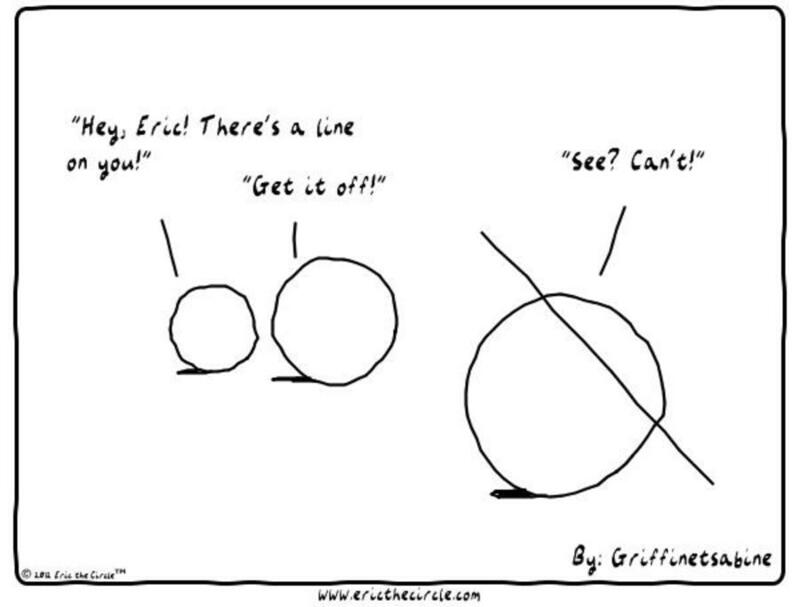 So I would accept a story in which Venn diagrams about Venn diagrams leads to trouble. The motif of tying logic and mathematics into magic is an old one. I understand it. A clever mathematical argument often feels like magic, especially the surprising ones. To me, the magical theorems are those that prove a set of seemingly irrelevant lemmas. Then, with that stock in hand, the theorem goes on to the main point in a few wondrous lines. If you can do that, why not transmute lead, or accidentally retcon a society out of existence? Mark Anderson’s Andertoons for the 8th of September just delights me. Occasionally I feel a bit like Mark Anderson’s volunteer publicity department. A panel like this, though, makes me feel that he deserves it. Jeffrey Caulfield and Alexandre Rouillard’s Mustard and Boloney for the 8th of September is the first anthropomorphic-geometric-figures joke we’ve had here in a while. Mike Baldwin’s Cornered for the 9th of September is a drug testing joke, and a gambling joke. Both are subjects driven by probabilities. Any truly interesting system is always changing. If we want to know whether something affects the system we have to know whether we can make a change that’s bigger than the system does on its own. And this gives us drug-testing and other statistical inference tests. If we apply a drug, or some treatment, or whatever, how does the system change? Does it change enough, consistently, that it’s not plausible that the change just happened by chance? Or by some other influence? You might have noticed a controversy going around psychology journals. A fair number of experiments were re-run, by new experimenters following the original protocols as closely as possible. Quite a few of the reported results didn’t happen again, or happened in a weaker way. That’s produced some handwringing. No one thinks deliberate experimental fraud is that widespread in the field. There may be accidental fraud, people choosing data or analyses that heighten the effect they want to prove, or that pick out any effect. However, it may also simply be chance again. Psychology experiments tend to have a lower threshold of “this is sufficiently improbable that it indicates something is happening” than, say, physics has. Psychology has a harder time getting the raw data. A supercollider has enormous startup costs, but you can run the thing for as long as you like. And every electron is the same thing. A test of how sleep deprivation affects driving skills? That’s hard. No two sleepers or drivers are quite alike, even at different times of the day. There’s not an obvious cure. Independent replication of previously done experiments helps. That’s work that isn’t exciting — necessary as it is, it’s also repeating what others did — and it’s harder to get people to do it, or pay for it. But in the meantime it’s harder to be sure what interesting results to trust. Ruben Bolling’s Super-Fun-Pak Comix for the 9th of September is another Chaos Butterfly installment. I don’t want to get folks too excited for posts I technically haven’t written yet, but there is more Chaos Butterfly soon. Rick Stromoski’s Soup To Nutz for the 10th of September has Royboy guess the odds of winning a lottery are 50-50. Silly, yes, but only because we know that anyone is much more likely to lose a lottery than to win it. But then how do we know that? Since the rules of a lottery are laid out clearly we can reason about the probability of winning. We can calculate the number of possible outcomes of the game, and how many of them count as winning. Suppose each of those possible outcomes are equally likely. Then the probability of winning is the number of winning outcomes divided by the number of probable outcomes. Quite easy. — Of course, that’s exactly what Royboy did. There’s two possible outcomes, winning or losing. Lacking reason to think they aren’t equally likely he concluded a win and a loss were just as probable. We have to be careful what we mean by “an outcome”. What we probably mean for a drawn-numbers lottery is the number of ways the lottery numbers can be drawn. For a scratch-off card we mean the number of tickets that can be printed. But we’re still stuck with this idea of “equally likely” outcomes. I suspect we know what we mean by this, but trying to say what that is clearly, and without question-begging, is hard. And even this works only because we know the rules by which the lottery operates. Or we can look them up. If we didn’t know the details of the lottery’s workings, past the assumption that it has consistently followed rules, what could we do? Well, that’s what we have probability classes for, and particularly the field of Bayesian probability. This field tries to estimate the probabilities of things based on what actually happens. Suppose Royboy played the lottery fifty times and lost every time. That would smash the idea that his chances were 50-50, although that would not yet tell him what the chances really are.